1/ What is a guide? I qualified at the National School of Mountaineering in Chamonix gaining an internationally recognised diploma. 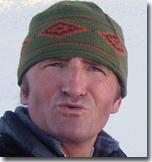 -Regarding alpine sports I am able to lead clients in the mountains and instruct off-piste and touring. 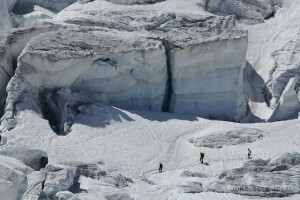 A guide is the only professional that is able to take a group onto a glacier. I don't teach beginners to ski. -I am qualified to take care of and instruct my clients mountaineering [ice climbing, climbing, walking on glaciers, summiting] as well as canyoning and via ferrata. 2/ How do I get to Chamonix? By train SNCF, by plane into Geneva, Lyon or Chambéry (easyJet, Ryan Air) by car (easyCar, Europcar) by taxi/ bus from Geneva (ats). 3/ Where can I stay? 4/ Where shall I buy or rent equipment? 5/ Do I need a lot of equipment? 6/ Can I learn to ski? 7/ Is there a weather webcam? 8/ Is there an Internet site for the ski resorts? 9/ Which ski pass should I buy? 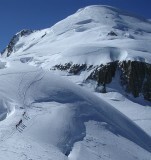 I advise you to buy the MontBlanc Unlimited ski pass, which includes Chamonix Valley, Courmayeur, les Houches. If there's heavy snowfall you will be happy to ski lower down the valley. Extra tickets have to be bought for Megéve, Cervinia Zermatt and La Thuile. If you need these tickets you will have to organise it. 10/ Do we get priority in the lift queues? As a guide I have priority in the lift queues and for booking the Midi cable car. If you want to ski a lot and find untracked snow its best to be early to avoid any potential crowds. 11/ Can I join a group? I usually have private clients who make their own groups but I can organise your needs if you want to join a group. 12/ How much does it cost? The guide's fee is dependent on the type of activity and is divided by the number of clients. In addition you pay your lift, your meals, accommodation, and the rental of your equipment. Traditionally you pay for the meals and accommodation of the guide. 13/ Is it all included? I'm a guide, not a tour operator so I can only suggest hotels and restaurants via websites. I can't legally provide an all inclusive package. You will have to organise the rest yourselves.